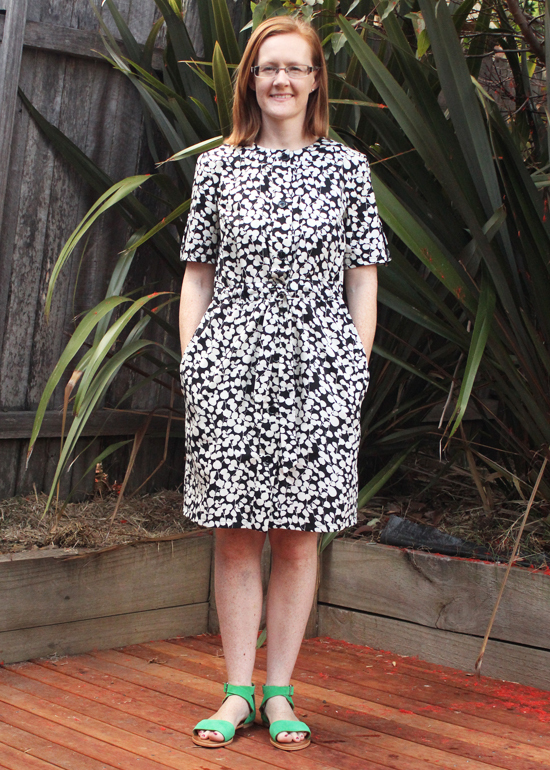 I've made this once before in a black and white floral print cotton back in 2012 which I still wear frequently during summer. I can't believe it's been so long since I last made this pattern because every summer I think I should make another one but it only took me 5 years! I still have the green sandals I'm wearing in this photo below, so clearly I still like this look. I took care to match the plaids at the front bands, but I deliberately cut the neck bands on the bias to get some contrast. I couldn't quite achieve those stripes on the sleeves to line up though, but as we all know no-one else ever notices these things! The only thing I didn't like on my original version of this dress is the sleeve - it has the sleeve tabs but the sleeves aren't actually long enough to fold up. So on this pattern I lengthened the sleeves so I could fold it back to form a cuff at the elbow. The other slight change I made was to lower the casing for the waistband tie slightly because I do prefer to wear my clothes slightly lower than my natural waistline and it reduces the puffiness of fabric that I get in the small of my back in the black and white version. But despite these minor issues overall I love this dress, and have worn it quite frequently in the last few weeks. It's pretty quick to make, although it does have quite a lot of buttons down the front which took a bit of time to sew on. 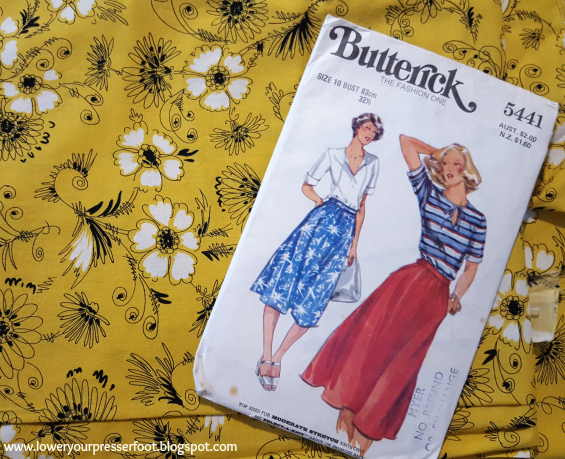 The cotton shirting fabric tends to wrinkle a little bit, but it was wonderful to wear during our atrociously hot summer days and the high neckline and sleeves covers me up from too much sun exposure so it's pretty much my perfect summer dress. With some flat shoes it works quite well for casual days, but with a navy jacket and heels I've worn it to work as well. After that intensive week of couture sewing with Susan Khaljie, I needed something quick and simple. Also, at that time were having crazy heatwave conditions and I needed something light and airy to avoid a major sweat induced meltdown. 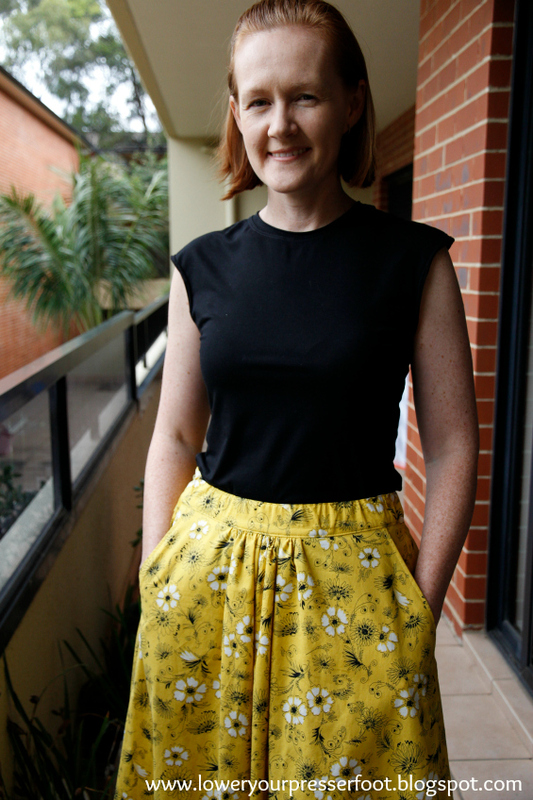 Ironically, the day I took these photos it's raining and rather cold but I have worn this skirt quite a bit in the previous two weeks when it was super hot. 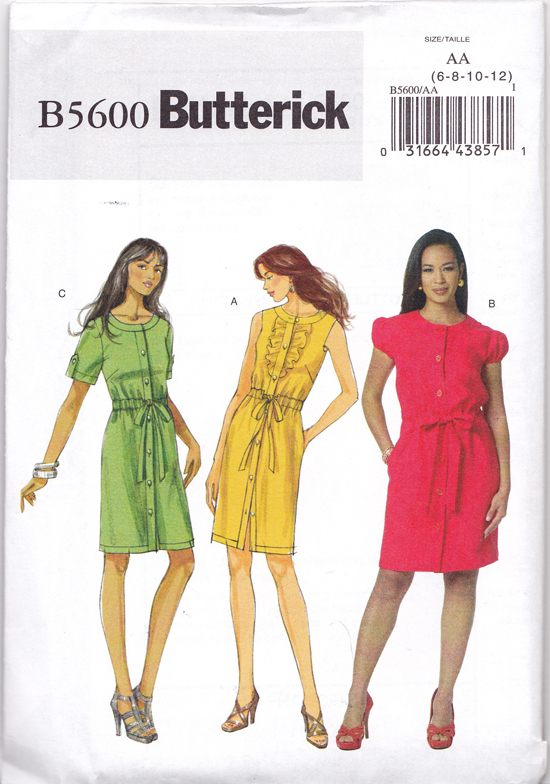 Enter Butterick 5441, a pattern that I picked in a opshop some time ago that has been sitting in my stash waiting to be used. I thought this style is a bit 1980s, but according to the vintage patterns wikia it may actually be 1970s instead. 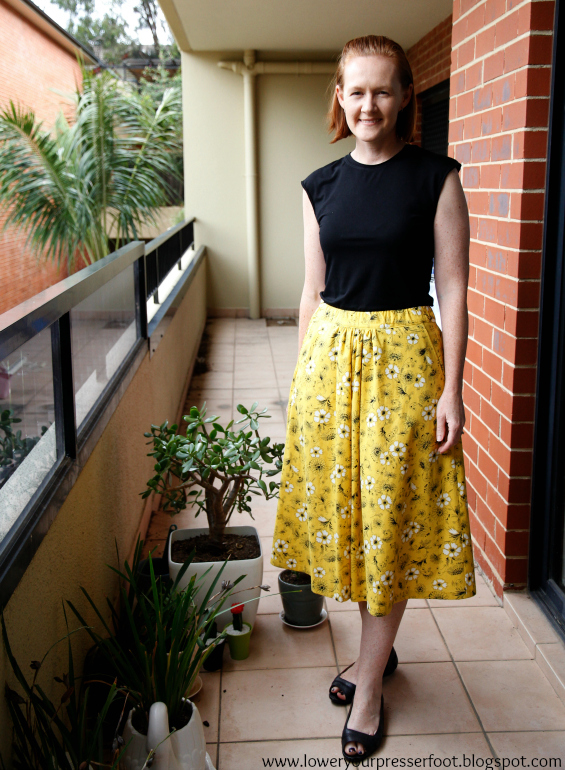 The fabric is a gorgeous golden yellow cotton that I picked up from the last Sydney Spoolettes fabric swap day generously donated by Stephanie. Yes - I used one of those many fabrics I amassed late last year! I even had a yellow zip in the stash also picked up from an opshop, so an all round cheap and cheerful project. So I did a quick and easy fix by inserting some elastic through the waistband. The waistband is slightly gathered now but I don't think it will be terribly noticeable and now it sits in a much better place. 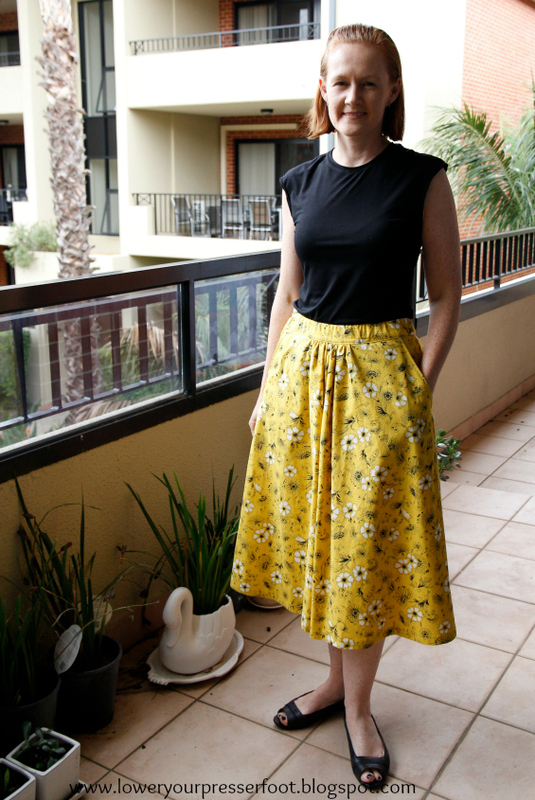 The back of the skirt is lightly gathered and the zip is in the side seam, so it really is a simple project to sew. 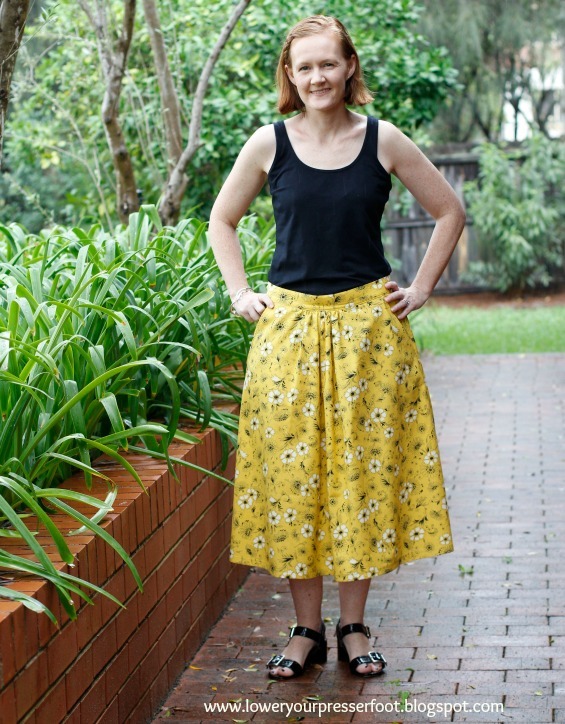 This is a new length for me - normally I hem my skirts at the knee, or slightly above but I thought I'd try this ballerina length. And I quite like it! And before you ask, no I haven't finished the Frnech style jacket. Nearly there, I've mostly got the trim on, but need to do the pockets and finish the lining. Oh and sew on the buttons. A bit more than I thought actually!